More than 15.7 million people identify as Italian American, making them the fourth largest group in America of European descent. Learn more about where your Italian ancestors came from and your family history by tracing the meaning and origin of your Italian last name. 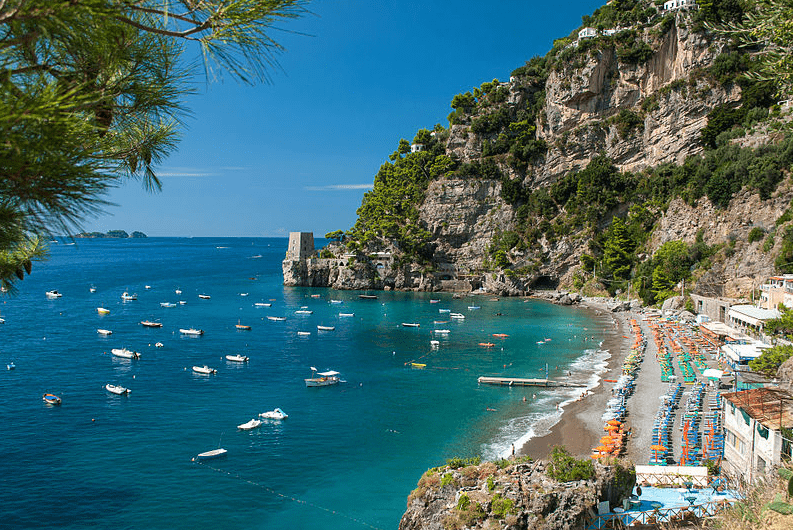 Photo: Fornillo Beach in Positano, Amalfi Coast, Italy. Credit: Mihael Grmek; Wikimedia Commons. Italian last names reflect the country’s rich culture, each carrying with them their own deeper meanings and stories. Some Italian surnames denote their parent’s name, where a person or their family came from, or what they looked like – and others describe their occupation or heritage. Until the Italian population increased, most people in Italy only had one name, a first name. Surnames were added descriptive elements and initially were only applied on an individual basis versus by family. Early Italian surnames originated from a few sources: patronymic, occupational, descriptive, or geographical. A smaller group of Italian surnames comes from abandoned children. Understanding what your Italian last name means and where it originated can help you learn more about who you are, where you come from, and your family history. 10 Common Italian Last Names – What Does Your Italian Surname Mean? Bianchi: another descriptive Italian surname, Bianchi means “white.” This may be in reference to the original Bianchi’s skin pallor or hair color. It is the most common surname found in Naples and around the Campania region. Colombo: meaning “dove,” Colombo is an Italian surname whose metaphorical meaning is still hotly debated. Some believe it was a name given to orphaned children, others that it was an occupational name to denote a seller of doves, while others believe it was merely fashionable in Christian Italy to be named after the symbol of the Holy Spirit. Esposito: an Italian surname with a dark history, Esposito means “exposed” and was a slang term for orphans and bastards. In ancient and medieval Italy (and through much of the Western World), it was tradition to leave an unwanted or disabled child in the wilderness, exposed to the elements to live or die on their own. Although this practice was abandoned in favor of orphanages and other means, the name for the unwanted and uncared for stuck: Esposito. Ferrari: the “Smith” of Italian last names, Ferrari is an occupational surname denoting a metalworker or blacksmith. Such occupational last names were common throughout medieval Europe as sort of a verbal business card. Greco: meaning “Greek,” this Italian last name wasn’t necessarily always meant to denote a person’s Hellenistic heritage, although many Greek traders and settlers lived in Italy. Being a Greek could also mean you were crafty or had a variety of other qualities considered “Greek” to a medieval Italian – some savory, others not. Marino: this occupational surname means “of the sea,” denoting you as a sailor. The medieval Italian city-states lived and died by their ability to trade at sea, and thus having skilled sailors was incredibly important. Calling yourself Marino made you immediately valuable, especially in such northern port cities as Venice and Genoa. Romano: a term used to identify a citizen of Rome, it is no surprise that Romano is one of the most common Italian last names. It is a surname that tells two stories. One: that you are from Rome. And two: that you are an heir to that ancient empire that is still a source of pride for Italians to this day. Russo: this Italian last name was first used as a physical description. Meaning “red” in Latin, it originally would have been added after a given name to indicate that a person either had red hair or freckled skin. Common variations of this last name include Russi, Rossi, Rosso, as well as longer names such as Rossetti, Rossetto, and Russotti. Italian naming conventions of our ancestors continue to be used today, which can be helpful in tracing your extended family. The firstborn girl or boy was named after the father’s parents and the second born was named after the mother’s parents. Keep in mind that regional dialects and spellings could also provide clues as to where your ancestors first originated. However, the spellings in America may have changed as the name was spelled phonetically. Italian last names carry with them the richness of a vibrant culture. With over 15 million Italian Americans in the U.S., the names in this article are just a handful of the Italian surnames. Search by name to learn more about your Italian genealogy. Discover untold stories and details about the moments, big and small, which shaped our ancestors’ lives. Start uncovering more than just names and dates of your Italian family heritage. I’ve seen on another site that Buccambuso is an Americanized Buccinfuso. I can’t seem to find any other information on this name, any ideas? If you are a member of GenealogyBank.com (https://www.genealogybank.com/), I would recommend that you search utilizing both of those names–Buccambuso AND Buccinfuso. Census records, passenger lists, Italian newspapers in America–all of these might just help you find that link you’re searching after. If you’re not a member, sign up and give us a look! Aside from that, Behind the Name (https://surnames.behindthename.com/bb/sur/718816) has a large number of possible spelling variations that you may want to consider looking into. Another list of potential resources would be here (http://surnames.meaning-of-names.com/genealogy/buccambuso/). In any case, we wish you successo with your research!